We arrived at the edge of the canyon just as the early morning fog was beginning to lift from the snow-carpeted ground. Along with some friends, we were disappointed that the snowfall had prevented us from seeing the rising sun herald the beginnings of a late winter day. But now at the view deck at Mather Point, we could see the fog gently fade from view. Soon the sun’s rays would pierce the early morning calm to reveal the vast and magnificent expanse of the Grand Canyon. Our trip to the Canyon with our friends wasn’t a carefully planned trip. At that time we were both living and working in California. Two friends who were visiting from the Philippines had asked us to take them either to Yosemite National Park or to the Grand Canyon and we suggested the latter. Along with two of our teammates and their children all eight of us made the overnight trip, driving more than 500 miles from our home in San Diego to the Grand Canyon in Arizona. 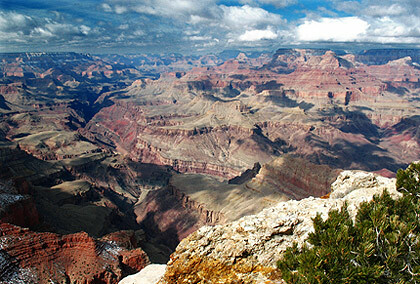 We’ve seen numerous photographs of the Grand Canyon but were not prepared to experience its vastness in real life. 277 miles or 446 kilometers long, the Canyon stretched as far as our eyes could see. Steep rocky walls in varied hues of red, orange, yellow and brown descended more than a mile to the floor of the canyon where they met the raging waters of the Colorado River at several points. Here and there were patches of green trees and shrubs. 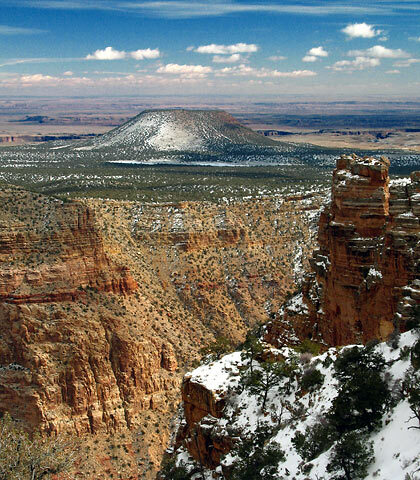 The light snow that had fallen added its contrasting white to a canvas of earth colors and left us thinking about our good fortune in visiting the Canyon in winter. At the South Rim, the most popular and accessible destination inside Grand Canyon National Park, we drove along Desert View Drive (Highway 64) to get to the different overlooks or view points: Mather Point, Yavapai Point, Moran Point, Lipan Point and Desert View are just a few of the almost two dozen viewpoints. The Grand Canyon Village, a center where visitors can park their cars, shop and eat, also lies along the South Rim and is a good base for exploring this side of the Grand Canyon. Yavapai and Lipan Points has panoramic views of the Canyon, with Yavapai Point offering views of the Colorado River below as well. Desert View lies at the eastern end of Desert View Drive and we were able to see the edge of the Grand Canyon here including the desert to the east. 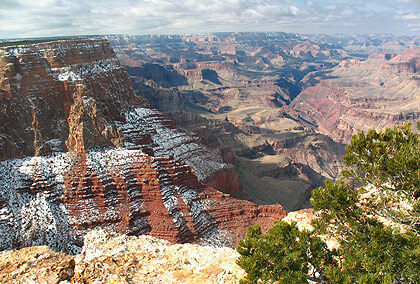 Lipan Point view: at 7,000 feet elevation the South Rim gets snow in the winter. 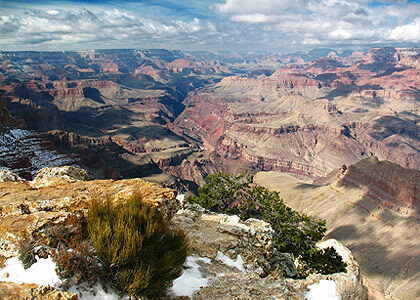 One can experience the Grand Canyon from three areas: the South Rim (which has already been mentioned), the West Rim and the North Rim. The West Rim includes Grand Canyon West and the Havasu Canyon, which in turn includes the famous blue-green waterfalls of Havasu, Navajo and Mooney. The North Rim is 1,000 feet higher than the South Rim and therefore cooler, and has plants and animals that cannot be found in the South Rim. The views of the Grand Canyon from the North Rim are likewise very different from that of the South. 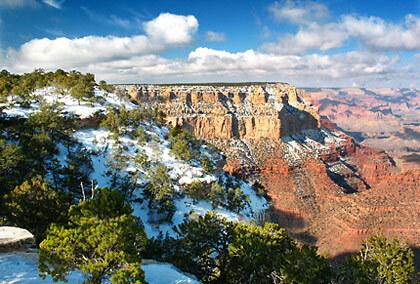 Because of heavy snow, the North Rim is closed to visitors during winter. 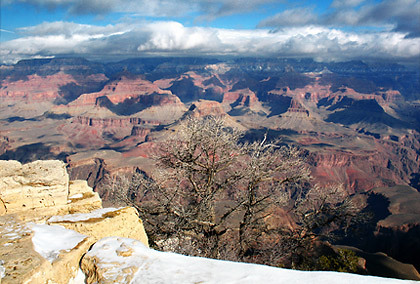 The South Rim is open at all times of the year. Interestingly, the temperatures at the bottom part of the Canyon along the Colorado River are similar to that found in Arizona’s desert regions. 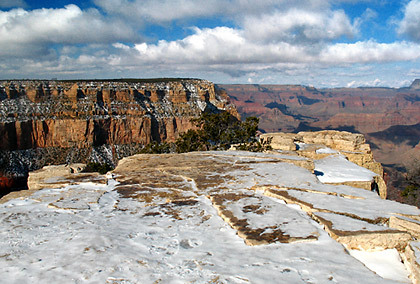 The South Rim, however, is about 7,000 feet above sea level and so, on this winter day, there was snow at that elevation. Although morning snowfall was light when we visited the Grand Canyon, it had become heavy by the time we left and headed back to Flagstaff where we would spend the night. We had planned to pass by Sedona and Red Rock Country on our way back to San Diego the following day. However there was heavy snow when we woke up and were advised by the people at the inn to avoid Sedona altogether and to just drive back the way we came. We were somewhat disappointed, of course, but as we drove back home we were more than thankful that we got to experience for ourselves one of the wonders of nature on this planet.